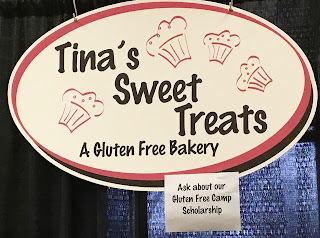 Although Baking Month is focused mainly on baking mixes, here's a quick change of pace to cover a gluten-free bakery I ran across in while doing the gluten-free grand tour of Cincinnati during my spring break. I knew I wanted to seek out a gluten-free bakery to secure birthday cupcakes. After all- how often do you get to enjoy safe gluten and dairy-free treats while traveling over your birthday! After looking at the list of vendors coming to the Gluten-Free for Cincinnati Expo (my recap here). I decided to reach out to Tina's Sweet Treats to inquire if they could handle both of my dietary restrictions. They responded back immediately and set me at ease with their assurance that they could get me a dozen cupcakes- and even bring them to the show to avoid having to drive up to Franklin, OH where their bakery is. I often assert that gluten-free businesses are founded and run by the nicest people, and here my belief was confirmed, and that was even before I tasted a cupcake! 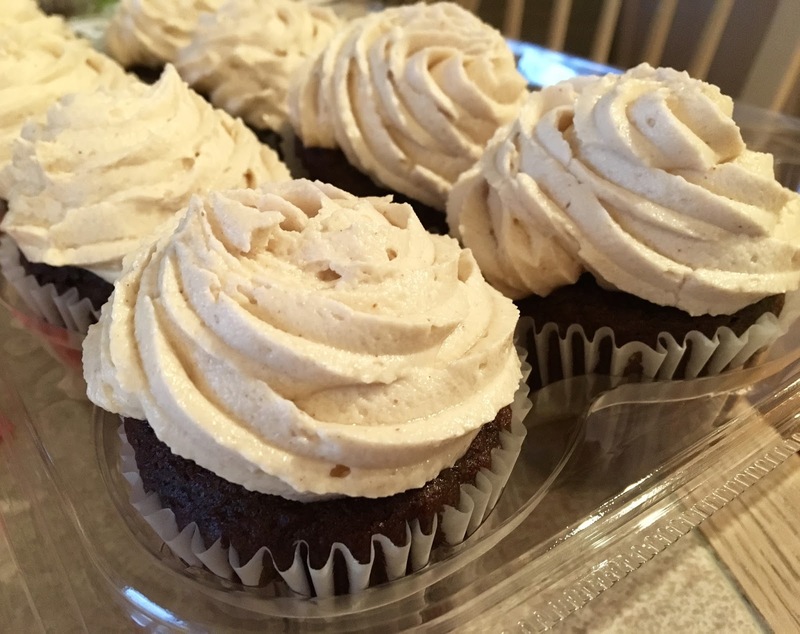 For my order, I opted for a dozen chocolate cupcakes with peanut butter icing, both of which are considered "basic" instead of "specialty." Because the bakery is entirely gluten-free, I didn't have to worry about cross-contamination, and any of their cakes or cupcakes can be made dairy-free upon request. Other bakery items can be found here, with asterisks to indicate which can be made dairy-free. I was glad I preordered them because the day of the expo, Tina's Sweet Treats did not bring any dairy-free items with them to sell. The cupcakes themselves were beautiful, only slight smushed in transit. The cake was rich, decadent, and moist while the peanut butter icing was whipped to a fluffy deliciousness, allowing the unmistakable nuttiness flavor shine. The combination of the two proved to be perfect, and I was certainly pleased with them as a birthday treat. I carried several back on the plane with me to Baltimore, and they froze beautifully and helped me carry on my birthday celebration a little bit longer as classes resumed. Next time I am in the area, I will definitely be dropping by Tina's Sweet Treats to sample more of their offerings. In addition to their bakery storefront, you can also locate their treats at local shops and cafes, including Jungle Jim's, which I covered in a previous post. For that full listing, click here. Overall I was impressed by Tina's Sweet Treat's friendliness, willingness to accommodate, and delicious cupcakes. They mark yet another wonderful gluten-free discovery while on the road. My daughter was dx with cealic after she left home...when she came home surprised her with a chocolate cake with caramel frosting from Tina's. It was amazing...almost too rich and decadent...served the cake to the whole family...they had no clue it was gluten free....I am lucky enough to live a few minutes from Time's bakery so when my daughter is in town she stocks up! She really is always that nice.